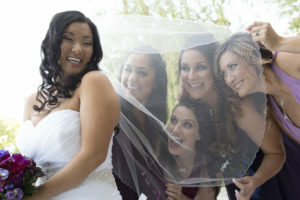 We offer a variety of multi-media options to help you create your dream Las Vegas wedding, involve friends and family, and preserve your special wedding memories! We have professional photographers on staff to provide the photography services outlined in each wedding package. Following your wedding, images will be available for online review and selection as outlined in your selected wedding package. After your wedding, you’ll be issued a direct link to your Wedding Album for proofing and selection of photographs as outlined in your selected wedding package. Additional digital images can be purchased with your wedding coordinator. No outside professional photography allowed. If you want to use your own outside professional photographer, there is a charge and the professional photography included in your package will be waived. Our professional DJ/MC is exactly what’s needed by a bride and groom seeking a true entertainment experience. Let our professionals capture your vision and spirit on this special day. A skilled and experienced DJ is a MUST for your event as it can literally make or break your wedding reception. As your Master of Ceremony (MC), your DJ will make announcements and introductions throughout the reception, as well as ensure a smooth flow between the different parts of your program. Our professional media team captures your wedding ceremony for distribution on DVD and a Downloadable link. This can be added to any package. Memories, events, and details are captured on your special day to allow you and your loved ones to re-live your happiness as many times as you wish. Certain wedding packages come complete with a Personal Wedding Website offering built-in wedding planning tools! Our Planning Tools are easy to use, intuitive and integrated seamlessly with your wedding website. Access and manage your information online at any time, and from any computer. Set up a budget for your entire wedding and generate an allowance for each individual wedding item with the click of a button! Record, organize and search all your guest’s contact info in one convenient place. Convenient online RSVP so you can keep track of who is coming. Enter the establishments or stores you’re registered for to make gift giving easier for your guests, friends, and family. Sending an announcement or informative message to your entire guest list is as simple as entering in the message and clicking Send. Post and share photos and videos of your engagement party, wedding preparations, wedding party, and more! After your wedding, share photos of the actual event, honeymoon – and life as a couple! Share your feelings, stories, and more with friends and family by blogging on your personal wedding website. While booking a wedding with Always & Forever will relieve you of many details, there are some things you’ll want to keep track of yourself. Create essential checklists that allow you to tabulate month-by-month the necessary items and reminders that you should be mindful of. Check them off as you go… your checklists will save what you’ve accomplished, and what you still need to get done.